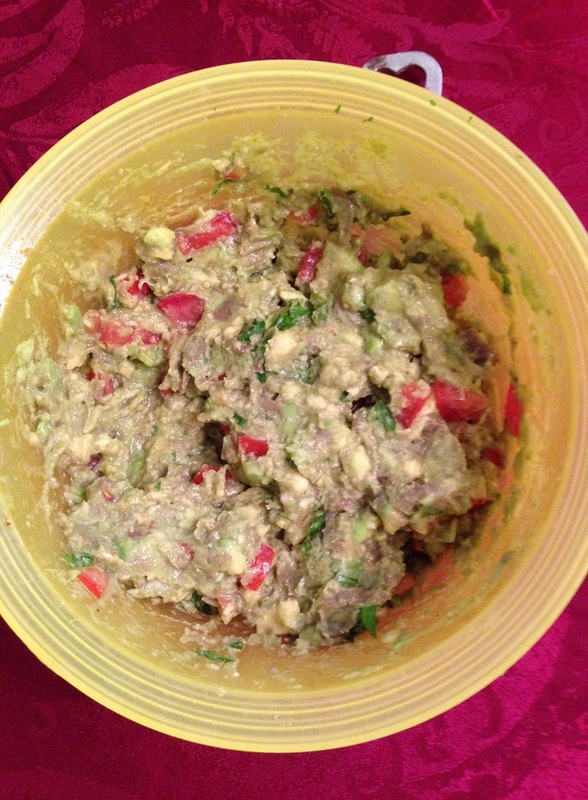 Try Guacamole the Alton Brown Way! I have been using the same basic recipe for guacamole that I make for years. Everyone seems to like it and I haven’t really deviated from that since I went with the old adage if it isn’t broken don’t fix it. National Guacamole Day was just recently (yes, there really is such a thing, and it seems pretty much everything and everyone has a day now, but that’s a topic for another time) I saw some other recipes for guacamole come up and I hit upon this one from Alton Brown, who is always one of my favorites and hasn’t steered me wrong yet with a recipe. His recipe for guacamole is very simple, as most of them are, but does seem to give you extra layers of flavor as well. In a large bowl place the scooped avocado pulp and the lime juice and toss the avocado pieces to coat them well. Drain the bowl, reserving the lime juice, after all of the avocado pieces have been coated. Using a potato masher, add the salt, ground cumin and cayenne pepper and mash the avocados. Fold in the onions, jalapeno pepper, Roma tomatoes, chopped cilantro and the minced garlic to gently blend the ingredients together. Add 1 tablespoon of the reserved lime juice. Let the guacamole sit at room temperature for 1 hour and then serve. A couple of things I noticed about this recipe. One, you get great flavors of everything and can get the freshness of the avocado, the lime, the cilantro and the onions and tomatoes with every bite. Two, using a potato masher does make a big difference as it allows you to get chunky guacamole so you get pieces of avocado with each bite instead of the results you get from a food processor or blender where you just get green liquid. I had always used a potato masher in the past when I made it anyway, so this made good sense to me. Coating he avocados with the lime juice before you mash them makes a difference in the flavor and seems to help with preventing the guacamole from turning brown quickly, just as adding the lime juice back in at the end does as well. Also, I had always refrigerated my guacamole right after I made it, but Alton Brown suggests that the cold refrigerator mutes the flavors of the guacamole, while when left at room temperature all you will need to do is give it a gentle mix and maybe add some salt and lime juice to adjust the seasoning. It is important to remember that even though you added lime juice, oxidation is still going to occur if you leave the guacamole uncovered while its resting. Make sure you cover it with plastic wrap, pressing it right down onto the top of the guacamole, and this will help it from turning brown. it’s a great and versatile dip that goes well with chips, crackers, tacos, quesadillas, hamburgers and countless other meals.